Twenty-five years ago, most everyone thought it was a waste of time and money. 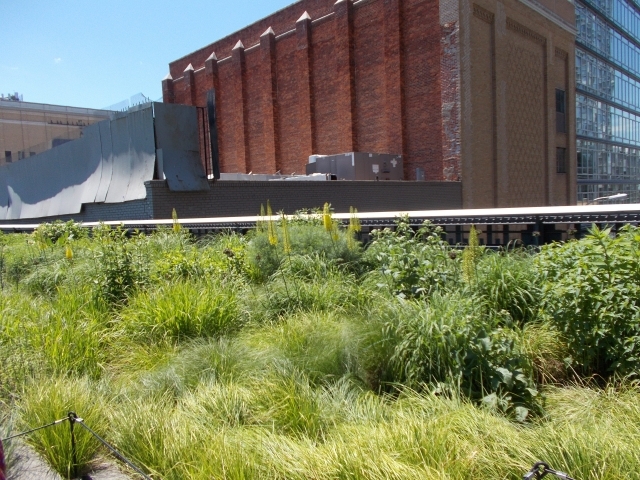 Designing a garden along the top of a weedy 19th century railroad viaduct. What could be more foolish! 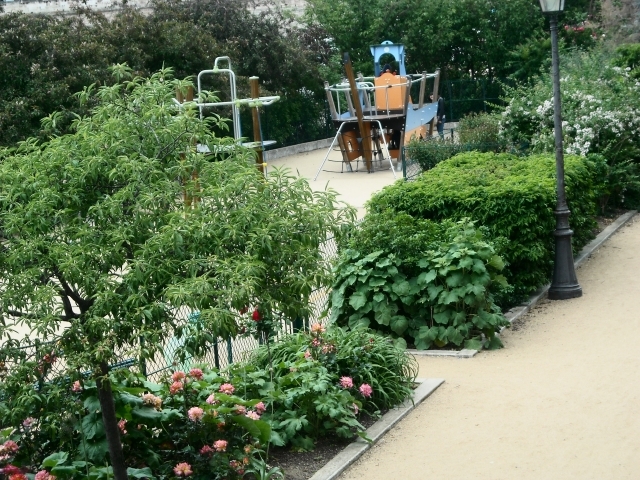 Today, the Promenade Plantee is a beloved mile-long garden stroll perched 30 feet in the air. 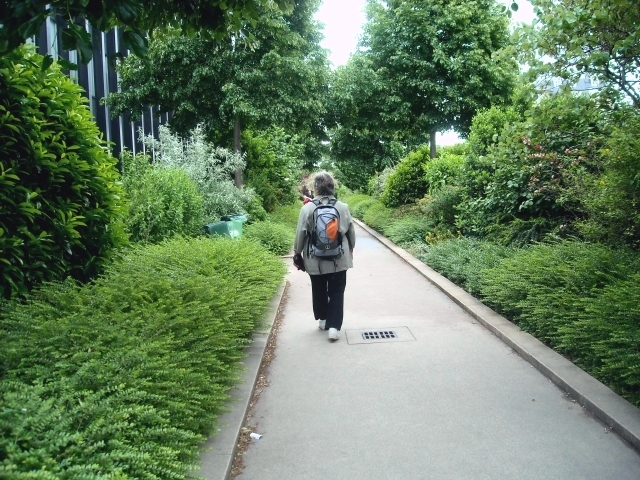 It’s the best kind of symbol for this city of walkers and an inspiration for railroad-to-garden projects round the world, in particular, New York City’s High Line. It was cold and slaty that day we visited in June 2010. 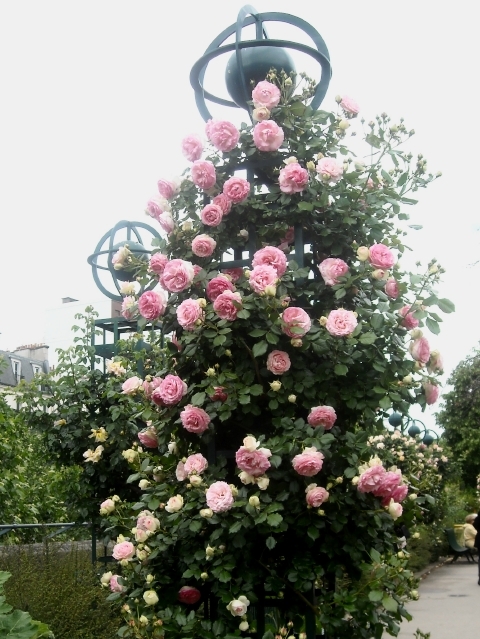 Gardeners Invincible, we’d already spent the morning shivering at Le Jardin des Plantes. 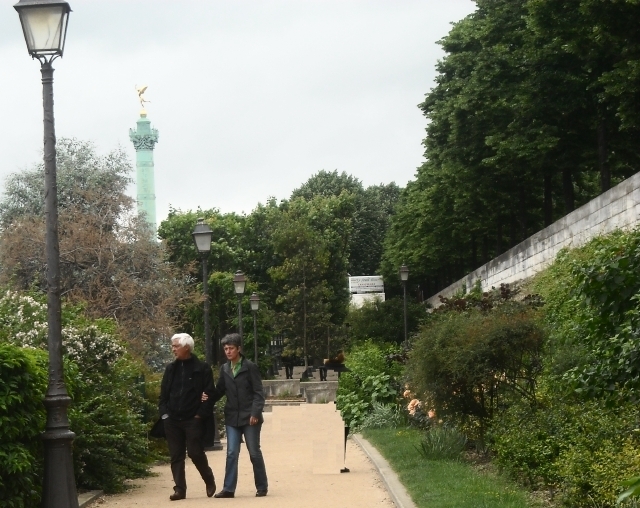 Now we were soldiering on in murky weather, crossing the Seine and hurrying along picturesque Canal Saint-Martin toward the Promenade when, surprise, we stumbled into yet another garden, Jardin du Port de L’Arsenal, one of the prettiest spots in Paris. We had to explore. 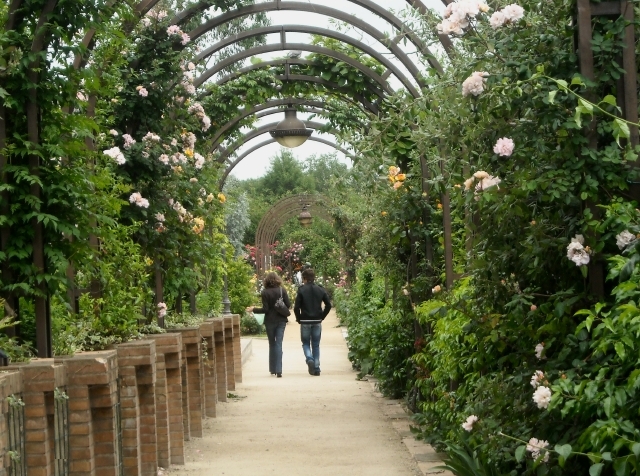 Like Promenade, it’s a landscaped walkway, a walker’s romantic getaway, but ten years older, and grounded on terra firma. 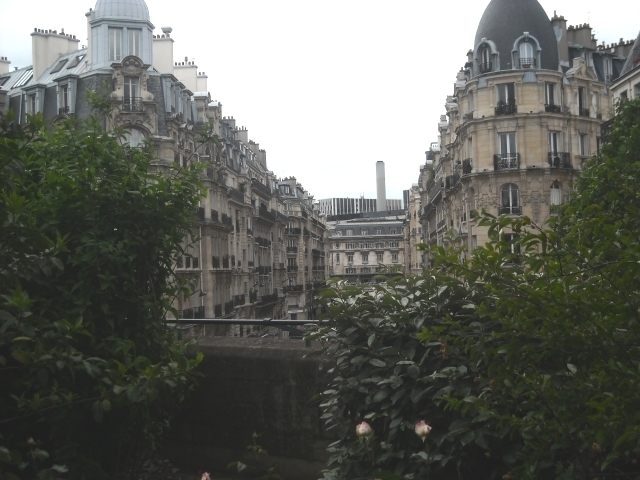 It runs along the banks of the canal, with terraces that lead you up and down levels. Playgrounds and pergolas . . .
walkways and banks of steps. . .
Lonely today, but later in the season, grassy areas will be crowded with sun bathers and the steps will become seating for people admiring pleasure boats or lunching with friends. 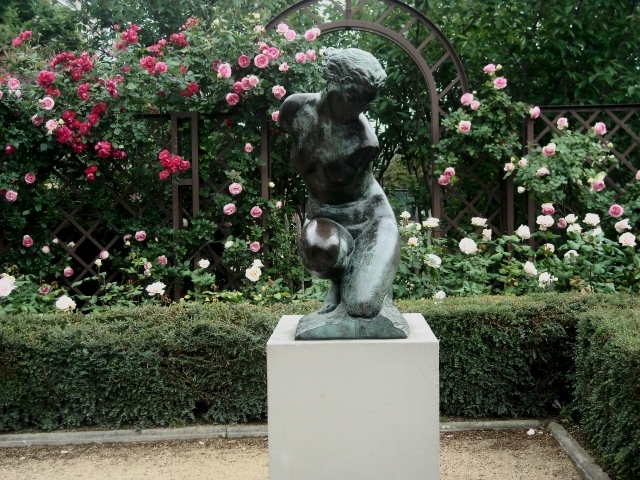 Walkers must have a special fondness for the sculpture of Diana Crouching, by Henri Arnold, placed to perfection among blooming roses. Her bronze torso is streaked with patina, except for that one knee, patted and polished by hundreds of hands. It was time to find a baguette for our usual lunch-on-the-run, which would be an act of heresy on a Sunday afternoon in Paris. Fortunately, dripping, sullen skies saved us from heresy. 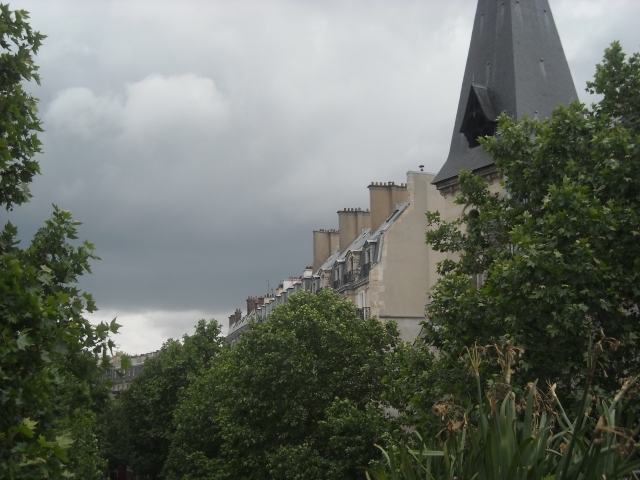 Like the cavalry in the nick of time, raindrops chased us to nearby Le Grand Bleu – and civilized dining. Le Grand Bleu restaurant, painted bright teal green, with big picture windows, brings to mind a summer retreat. In fact, on nice days you can sit outside under umbrellas and watch traffic on the canal. Not on this particular Sunday. Sunday midday meals are the penultimate slice of civilization for Parisians. They are a fine mix of earnest conversation and casual lingering over all sorts of aperitifs, appetizers, entrees, wines, digestifs, and, of course, coffee. No speedo baguettes here. But that was okay. We’d linger here while the rains came down. We felt very French. Apparently not quite French enough. While we might pass for natives on the street, we acted every bit like outsiders in here. Sizing up our tentativeness, the maitre d’ greeted us warmly and took us under her wing. Zees ees a feesh place. You know, zees ees a feesh place? You like feesh? Well. . .Susan preferred duck. French enough, we thought. But we only wanted one glass of wine. And one of us preferred coke. This was almost as uncivilized as a speedo baguette. Still,we thought, one chaste glass of wine singularly trumped wobbling out of the restaurant in a haze of indulgences. Oh, and we preferred tea instead of coffee. No coffee! No coffee! The waiter was aghast at this particular breach of civility. One can only imagine the conversation in the kitchen. Meanwhile, the couple at a nearby table, smoking out our gaucherie on-the-sly, shook with suppressed laughter each time we opened our mouths. We took it all in with good humor. 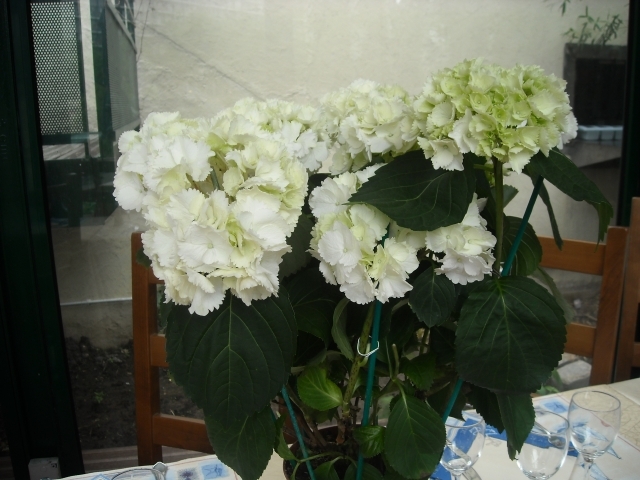 We still laugh at our comedy of errors that day, but we’ll always think kindly of the warmth and the welcome of the maitre d’, who hurried over as we were leaving to thank us profusely for dining at her restaurant. Spontaneously, we reciprocated our enthusiasm for the fine-tasting meal. But we did not apologize for being uncivilized. We didn’t think it mattered to her. 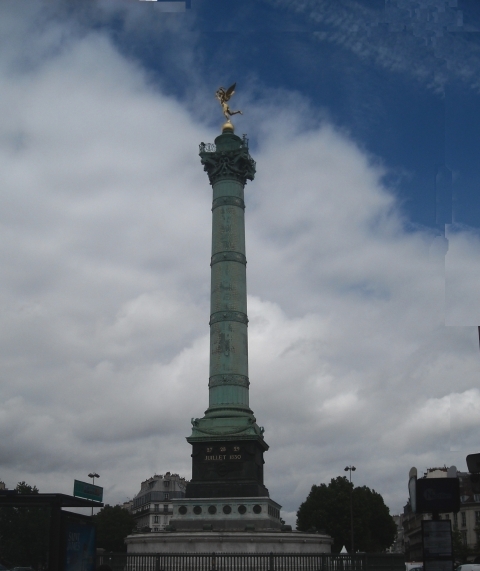 The sun was shining, and we were off, heading toward L’Opera Bastille to begin our exploration of yet another garden. 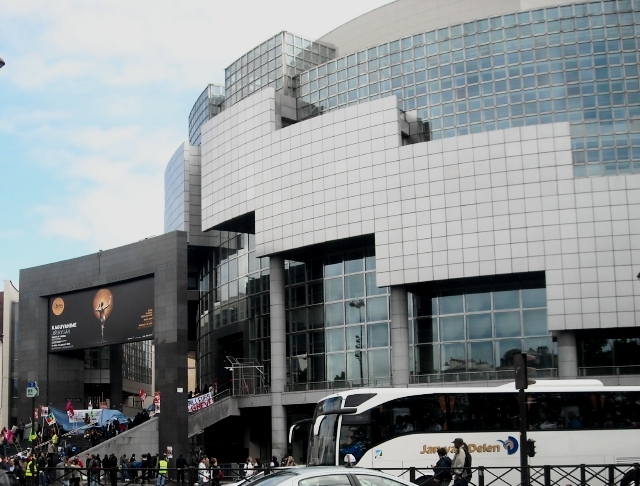 The Promenade begins near the modern L’Opera Bastille, where rue de Lyon and Avenue Daumesnil cross. 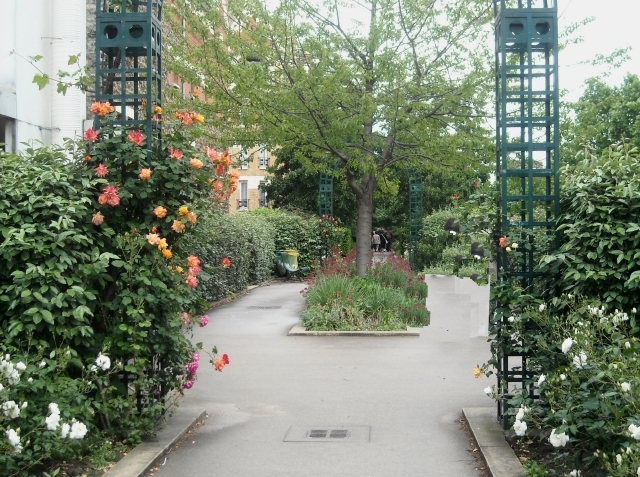 High above the avenues we walked through arbors of roses — yes, more roses. 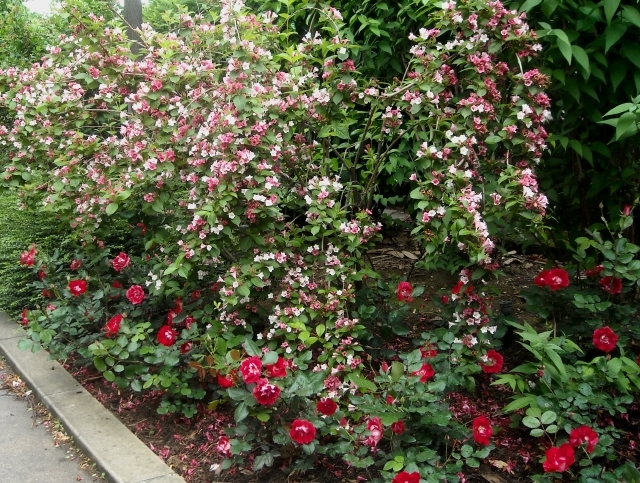 It’s almost June in Paris – and blooming roses are bringing color to the drab days of May. 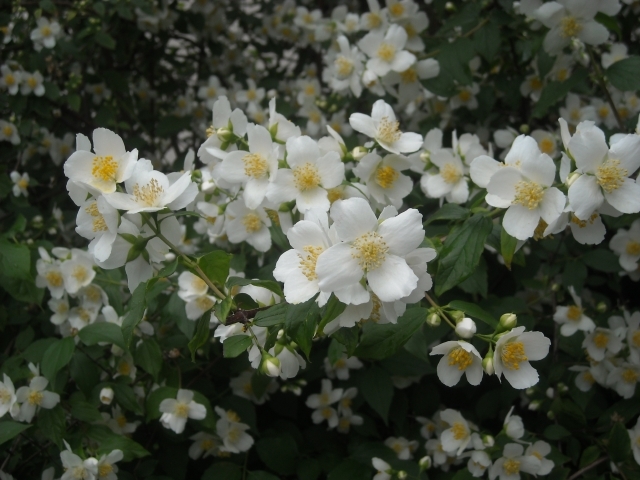 As are those familiar, old-timey plants that we grow in our gardens. . .
. . .and some that were new to us. We could almost hear the refrain of Irving Berlin’s Let’s take an Old-Fashioned Walk. This was classic French romanticism at its best. 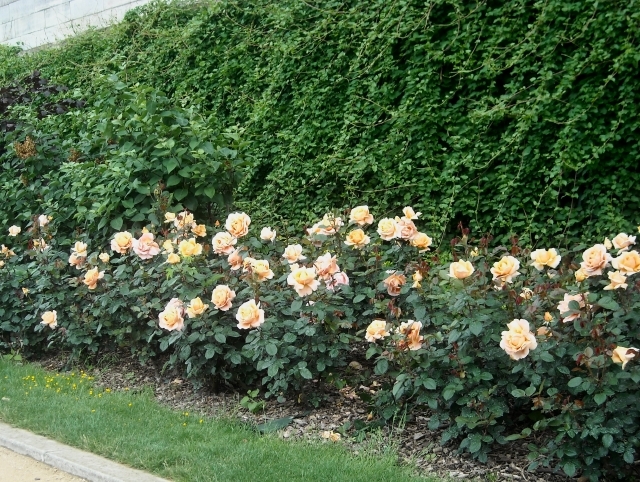 Clipped hedges add a sense of intimacy to portions of the Promenade. 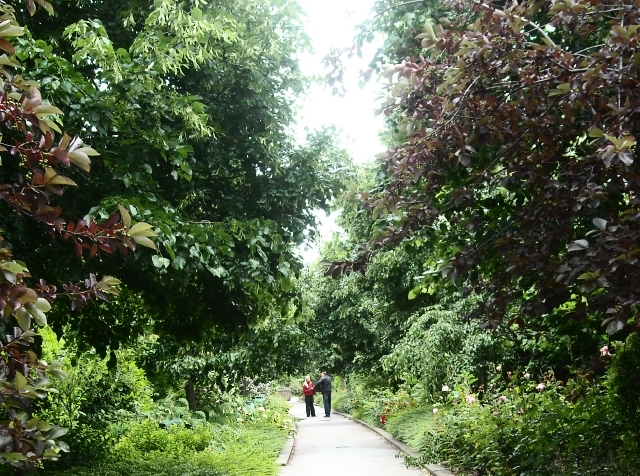 Sometimes, plantings were so lush we felt we had been cast into some Shakespearean woodland, complete with a rendezvous. 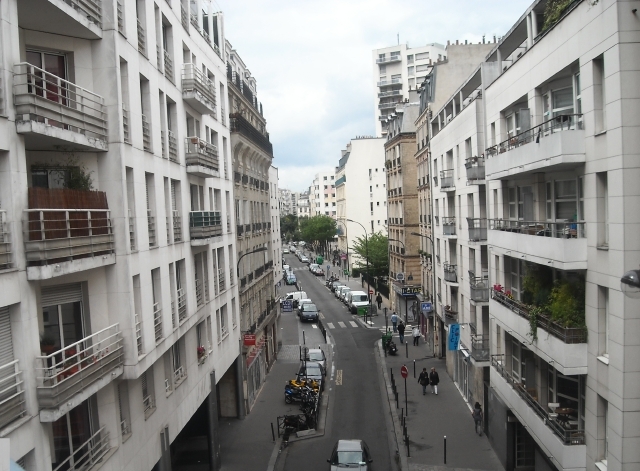 When we crossed over an avenue, the corridor widened and plantings thinned and we could catch spectacular panoramas of rooftops bristling with chimneys in tranquil old neighborhoods. 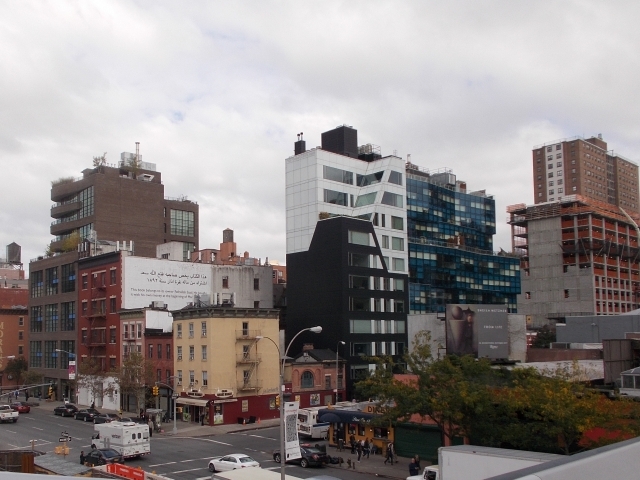 Further along, modern apartment buildings rose, signs of neighborhood renewal. In another month, the pond will come to life. Even without sparkling waters, the blooming iris and neat mounds of greenery backed by formal hedges evoke a sense of order and serenity. 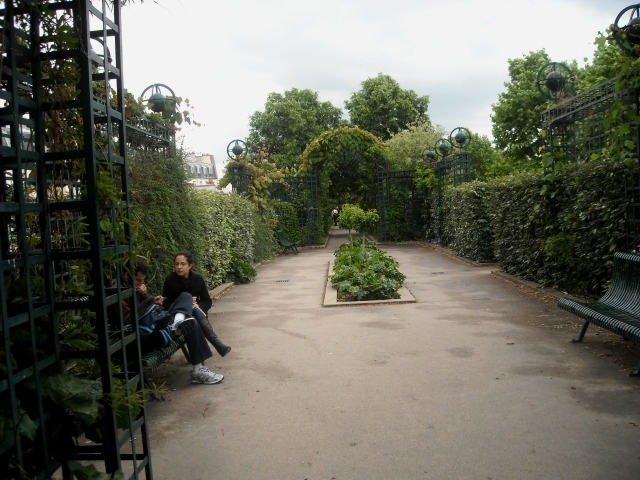 The elevated Promenade ends at the Jardin de Reuilly, once a commercial depot, now another rails-to-garden conversion. 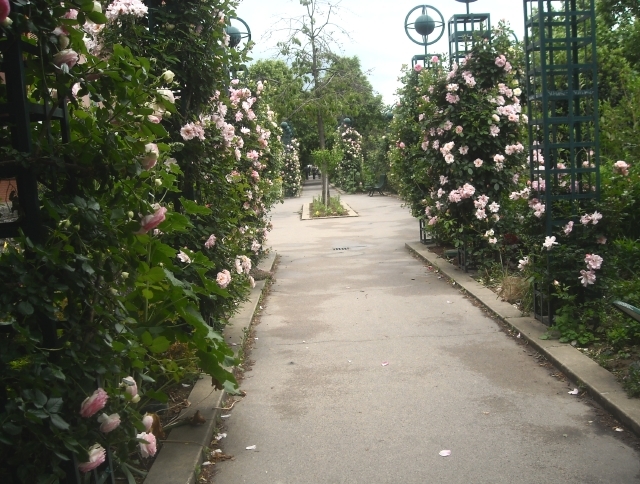 Here the Promenade continues at ground level for another mile and a half or so, slicing through Paris’ entire 12th arrondissement. And here is where we stopped. 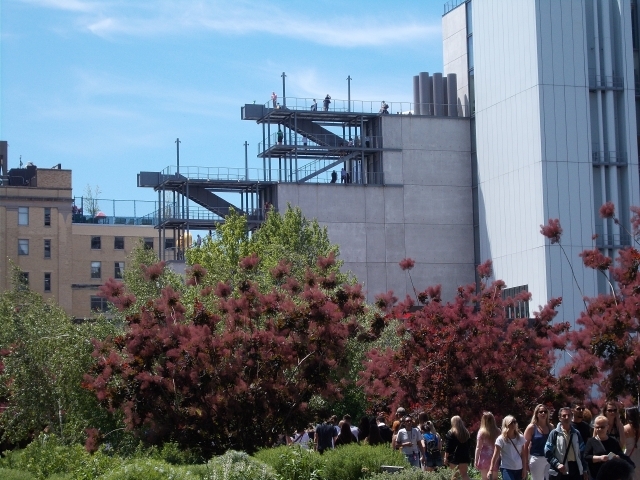 Seven years later we visited New York’s sky-walk: The High Line, directly inspired by the Promenade, an ocean apart and a design-world apart. There’s no forgetting the old railroad here: tracks, ties and ballast are integral to the design. Grasses and hardy perennials, with some shrubs and trees, replace weeds but remind us that once they thrived here. 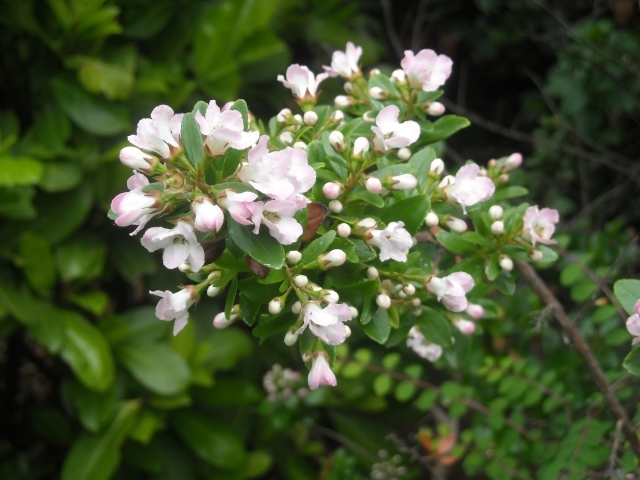 Plants cycle from summer greens to autumn wheats and russets and go to seed before being cut back in spring to begin life anew. Cityscapes below tell of a gritty industrial and railroad history. To the east, a polyglot of modern and period architecture reflects independence and a tumultuous social history. 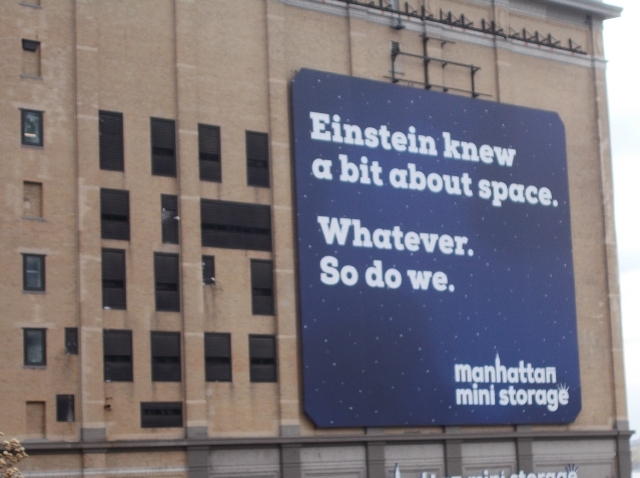 Signs remind us of that incomparable urban New York humor. 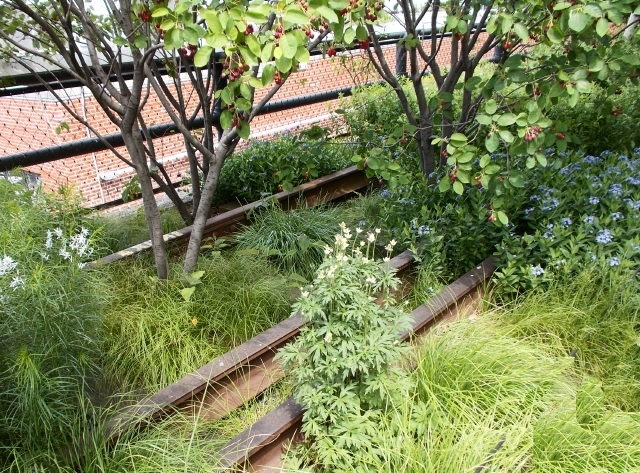 As you walk The High Line you feel that you are straddling the past, ready to ride into the future. 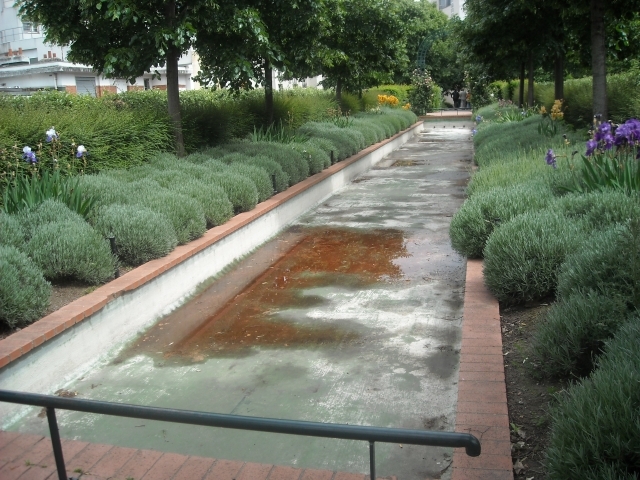 Conversely, the Promenade Plantee camouflages, no, visually eradicates, its railroad history. 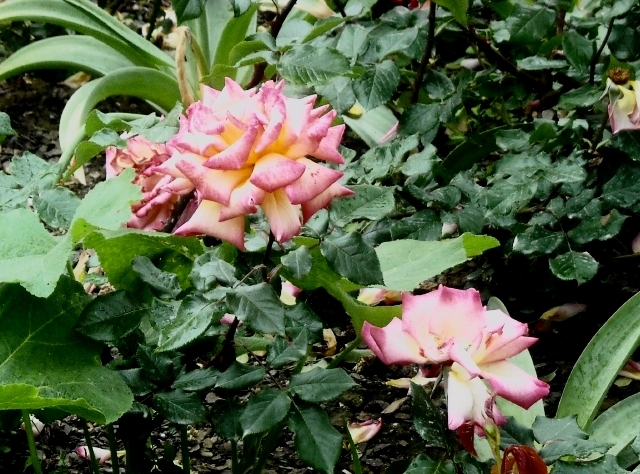 Where weeds held ownership, shrubs, allees of trees, and bowers of roses now create a romantic escape. Hedges are clipped. Tuteurs are trimmed. Nothing grows out of bounds. 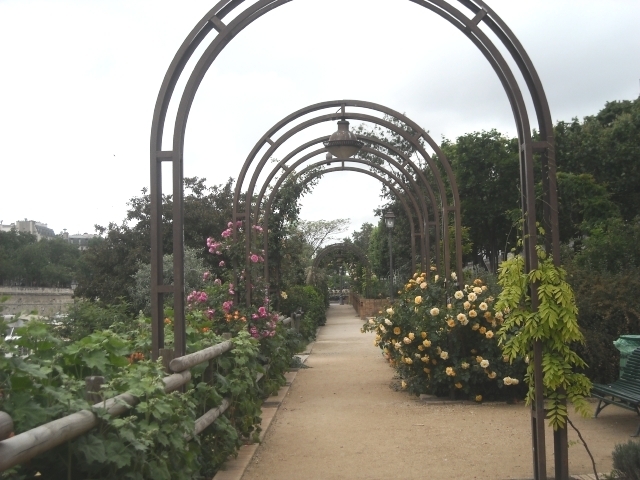 The walk nestles snugly in the bosom of historical French gardens where environment is controlled by man. We are whisked back into the past, propelled, too, by those beautiful old neighborhoods with the chimneys lined up in rows. Two walkways in the sky, oceans apart. Symbolic of old worlds and newIn?